"Sometimes He wrings the worship from our hearts." There are times when worship overflows easily and effortlessly from a heart full of gratitude and praise. Yet, there are other times when God seems far and we feel we have nothing left to offer. We are tired, or thirsty, or imprisoned in our own chains through our own devices, or caught in the waves of a tumultuous sea. This is when God shows us His steadfast love. He wraps His eternally powerful, ultimately creative, nail-scarred hands around our hearts and squeezes with appropriate might—yielding an honest plea for Him to save us and deliver us from our circumstances, fears, and self control. And He does. He initiates with His steadfast love, and responds with the same. 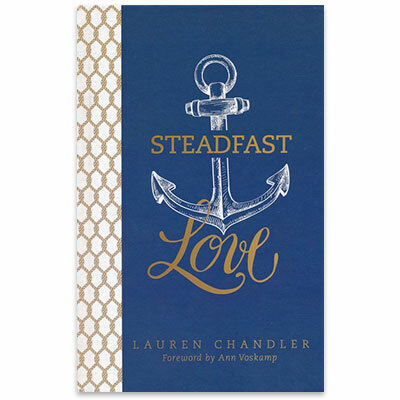 Walk with Lauren as she shares what she has learned of the steadfast love of the Lord. Lauren Chandler is a wife and mother of three. Her husband, Matt Chandler, serves as the lead teaching pastor at The Village Church in Dallas, Texas. Lauren is passionate about writing, music and leading worship, not only at The Village Church, but also for groups across the country. The Lord has taken Matt and Lauren on a challenging journey, beginning with the November 2009 discovery of a malignant brain tumor in Matt. The Lord has been infinitely merciful to provide peace and comfort in uncertainty, and joy in times of victory and healing. Lauren and her family have been given a deeper trust in clinging to the Lord and his cross during this appointed season of valleys and storms.